When most of your focus is spent on keeping your business open, your marketing’s planning and scheduling can often fall behind. Luckily, Constant Contact has just made it easier than ever to plan out your marketing emails. Introducing the official Constant Contact Marketing Calendar. The marketing calendar provides you with a monthly campaign view that makes planning, creating, and scheduling your marketing more efficient— saving you time and driving better results for your business. To access the calendar in Constant Contact, log in to your account, go into the Campaigns page, and click the calendar icon on the top right of the screen (next to the orange ‘create’ button). Once in the calendar view, you can view past emails, stay up-to-date on holidays, and create and schedule mailings. You can now use the calendar to view all the emails you’ve previously sent in one organized place. After clicking on a past mailing, a box will pop up telling you the exact day and time that email was sent, while also giving you a summary of how the email performed that includes its open rate, click rate, and the exact numbers of opens, clicks, and bounces it got. You are also given the option to get more performance details and to quickly make a copy of the mailing. US holidays are pre-populated in the monthly calendar view. This way, you will never miss an opportunity to drive business for an upcoming holiday. By toggling the filters in the right column, you can hide the holidays from your calendar. Clicking on a holiday will give you a description of the event with tips on the type of email to send. 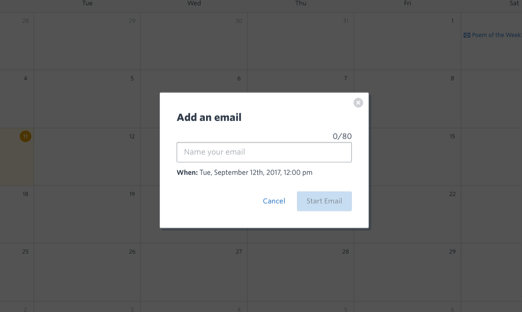 Click on a specific date on the calendar and a box will pop up, prompting you to “add an email.” Enter the name of the mailing, and click “start email” to begin creating. You will then be brought to the templates page. After setting up your email, you can either send immediately, save that email as a draft, or schedule it to go out on the day you clicked in the calendar. By viewing your emails by the month, you’ll gain a clearer idea of how much you’re sending. You’ll also avoid the panic of trying to write and send your email at the last minute by scheduling in advance and having holidays prompts. The Constant Contact Marketing Calendar provides the most effective way to plan, create, and schedule your emails. Ready to try the Constant Contact Marketing Calendar for yourself? Log in to your Constant Contact account to look at past campaigns, view holidays and schedule emails today! Not yet a customer? New to email marketing? Try it out free for 60 days.